Metropolitan Hilarion will visit the Diocese of Australia & New Zealand through Pascha and Bright Week. Bishop Nicholas will lead the Sacrament of Holy Unction in the Synodal Cathedral of the Sign in New York City. On Lazarus Saturday, Bishop Nicholas will celebrate Divine Liturgy in Holy Myrrhbearers Church in Brooklyn, NY. On the eve of the great feast of the Entry of the Lord into Jerusalem (Palm Sunday), Bishop Jerome will lead the All-Night Vigil in Holy Epiphany Church in Roslindale (Boston), MA. On the great feast of the Entry of the Lord into Jerusalem (Palm Sunday), Bishop Nicholas will lead the divine services in the Synodal Cathedral of the Sign in New York City. On Sunday evening, he will lead the Sacrament of Holy Unction in Holy Virgin Protection Church in Nyack, NY. On Sunday evening, Bishop Jerome will lead the Sacrament of Holy Unction in "Unexpected Joy" Church in Staten Island, NY. Bishop Nicholas will lead the divine services of Holy Week & Pascha in the Synodal Cathedral of the Sign in New York City. On Bright Monday, Bishop Nicholas will celebrate Divine Liturgy in St. Alexander Nevsky Diocesan Cathedral in Howell, NJ. On Thomas Sunday, Metropolitan Hilarion will celebrate Divine Liturgy in Holy Dormition Convent "Novo-Diveevo" in Nanuet, NY, followed by memorial services at the cemetery. On Thomas Sunday, Bishop Jerome will celebrate the Divine Liturgy of St. Mark in St. Panteleimon Church in Hartford, CT.
On the Sunday of the Myrrh-bearing Women, Metropolitan Hilarion will lead the patronal feast day of Holy Myrrhbearers Church in Brooklyn, NY. On the Sunday of the Myrrh-bearing Women, Bishop Jerome will celebrate Divine Liturgy in Holy Virgin Protection Church in Nyack, NY. Metropolitan Hilarion will lead the patronal feast day of Our Lady "The Inexhaustible Chalice" Church in Brooklyn, NY. On the Sunday of the Paralytic, Metropolitan Hilarion will celebrate Divine Liturgy in the Synodal Cathedral of the Sign in New York City. 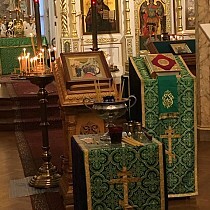 On the Sunday of the Paralytic, Bishop Jerome will celebrate Divine Liturgy in St. Nicholas Church in Poughkeepsie, NY. Metropolitan Hilarion will celebrate Divine Liturgy and mark the first anniversary of the repose of Protopresbyter Valery Lukianov at St. Alexander Nevsky Diocesan Cathedral in Howell, NJ, co-served by Archbishop Gabriel of Montreal & Canada. On the Sunday of the Samaritan Woman, Metropolitan Hilarion will lead the divine services in St. Alexander Nevsky Diocesan Cathedral in Howell, NJ, co-served by Archbishop Gabriel of Montreal & Canada. On the Sunday of the Blind Man, Metropolitan Hilarion will celebrate Divine Liturgy in Holy Trinity Monastery in Jordanville, NY, co-served by Bishop Luke. On the great feast of the Ascension of the Lord, Metropolitan Hilarion will celebrate Divine Liturgy in the Synodal Cathedral of the Sign in New York City. 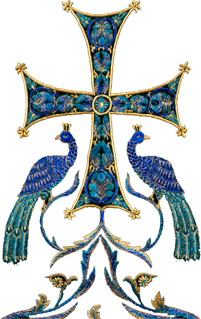 On Holy Spirit Day, Archbishop Gabriel of Montreal & Canada will lead the patronal feast day of Holy Trinity Monastery in Jordanville, NY, co-served by Bishops Nicholas & Luke. Metropolitan Hilarion will lead the 25th anniversary celebrations of the glorification of St. John of Shanghai in Joy of All Who Sorrow Cathedral in San Francisco. On the Sunday of All Russian Saints, Metropolitan Hilarion will lead the divine services in St. Alexander Nevsky Diocesan Cathedral in Howell, NJ, co-served by Bishop Luke of Syracuse. Metropolitan Hilarion will lead the 100th anniversary celebrations of the founding of the Church of the Nativity in Erie, PA.
Metropolitan Hilarion will lead the patronal feast day of St. Seraphim Memorial Church in Sea Cliff, NY. Metropolitan Hilarion will lead the patronal feast day of St. Panteleimon Church in Hartford, CT.